Well the last 3 weeks since the Kokoda challenge have been pretty busy, it would seem that lots of things got put on hold in the lead up the race and now with the dust finally settled there has been lots of work to do catching up, both professionally at work and also emotionally at home with my wife. My recovery post Kokoda was an interesting beast, I had Sunday off completely content to catch up with Dave and Ben over breakfast and debrief the race. It still is a bit mind boggling that while we were having breakfast on Sunday there were still teams out there trudging through the course! I can barely get my head around it and in my eyes these people have much more courage, motivation and perseverance then we will ever have, to push through countless hours in the cold and see the day break must have been both punishing and (hopefully) rewarding for them. Anyway the Monday afterwards was to be my first run, on the advice on Andy I went out for a very very easy 20min on the beach. I don’t usually run so soon after a big race but keen to trust Andy’s guidance I laced up and went out. Surprisingly it wasn’t too bad, no major pain anywhere but on the flip side my legs felt like they were full of concrete! The next couple of days were hit and miss as the swelling reduced in my legs and the little niggles came out. To my surprise my hamstring was no worse than before the race which was a real positive, it still needed some attention but it wasn’t destroyed that’s for sure. A few visits to Robbie at Insight massage later and it was starting to free right up. It wasn’t really until the next week that my running started to get back on track and I managed to get out a decent speed session of 5x 1km reps (@ 10km pace) on the Tuesday. 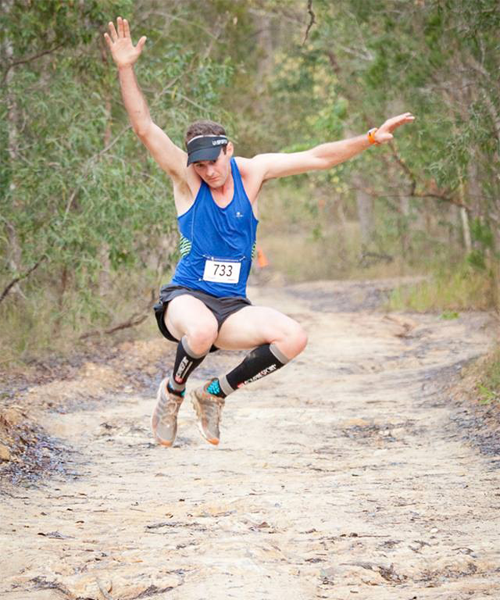 I had planned to go to the Ipswich Park to Park Half marathon on the Sunday 28th just 2 weeks after the Kokoda race. My key “indicator” session that was to determine if I would race the Park Half was a Thursday 20min Tempo at Half marathon race pace – with the idea being that if It felt great and I had no lingering hammy issues I would go to the half. As it turned out the session felt great, no worries at all but my hammy pulled up just a bit tight afterwards…..so playing on the safe side we canned the Ipswich half and replaced it with a hit out in the Race 3 of the Soleus 6km Series held in Nerang on the Saturday 27th followed by a 3hour long run the next day. Now I had previously won Race 2 of the 6km series a few weeks before Kokoda setting a new course record of 23.54 in the process, it was a solid result as I was chased all the way to the line Danny Carr (who as a 5km Pb around 14min I think). 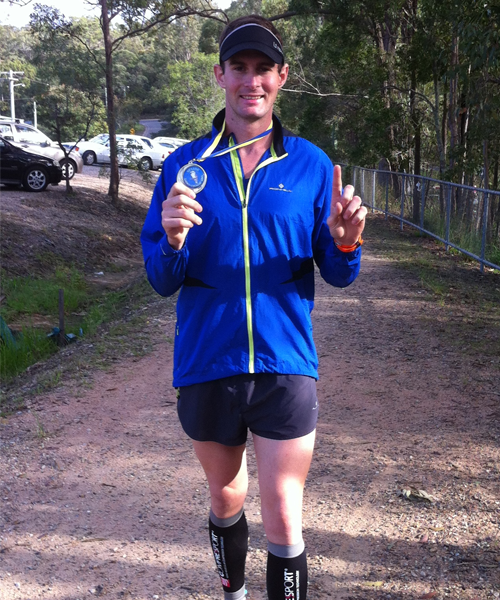 So going into race 3 I wasn’t expecting much, my legs still had a bit of fatigue in them from Kokoda a mere 15 days prior, I still needed to nurse my hammy through the ups and downs and I had heard Danny wasn’t to race this time around…bummer!. So I did a warm up of about 5km with my speedy whippet (who god forbid couldn’t miss out on running) then settled in to the start line and waited for the fun to begin. In true Ian Cornelious style there was no starters gun but more a relaxed … ready….GO! Straight away the likes of Brad Must and a few others shot to the front and duelled it out to the gate, high jumping the gate I sat in behind Brad and a young kid in cross country spikes for the first 50m of the single track. At the first chance I shot by the boys and opened up in what I think is the best part of the course. The trail in the first 1.5 km is all singletrack and is reasonably technical , rutted out, rocky, a creek crossing and lots of roots. Lucky for me the boys are yet to get their head around running fast on the technical stuff so by the time I hit the fire road I couldn’t see anyone behind and trust me I needed the gap, I instantly noticed my legs were full of lactic and strangely my right quad more than anywhere else. I settled into a more comfortable pace as I climbed up the last part of the rise on the fire road, once at the top I thought to myself – “just take it easy no need to trash yourself…long run tomorrow”. So I backed it off to about 25km race pace effort and cruised my way down to the turn around at 3.5 km. At the turn I noticed I hit it at 13min 30sec…..slow – too slow ….I had gone pretty easy down to the turn and thought to myself that I didn’t want to run a 26min race…. So I picked it back up again and started to work hard on the climb back out, passing all those coming in the other direction was great…I made sure I gave everyone a few words of encouragement as it helped me as much as them. Hitting the intersection at the top of the long decent to the finish I was working pretty hard, I let my legs go on the decent bouncing off rocks and striding out ,thanks mainly to the plush but fast Helios I chose to wear. I blasted through the final single track at break neck speed (I think about 2.50-3min/km pace) and was spat back out on to the fire road for the final push to the line. Seeing Steve from SOK Images waiting for a picture I made sure I quick stepped and got in a trail jump before pushing all the way to the line. In the end I ran a 23.41…a 13sec PB, I was stoked and could hardly believe I did it, with Kokoda in the legs and massive negative split under my belt I felt pretty darn happy. Since the race my training has been going pretty good, I did the 3 hours the next day no worries and have been even getting in a few road tempo’s done in the lead up to my next race the Alice Springs 60km. The Alice race is a road event and it pretty much flat, its on the 18th of August and it has come around very quickly so fingers crossed I can pull out something decent for it. It too will be an indicator race for me and gauge whether or not I will join team mate Ben Duffus at the Surf Coast Century 100km in September. On other news after the successful (albeit last minute) implementation of an all liquid nutritional plan featuring Endura Optimizer and Endura Gels during the Kokoda Challenge, I was so impressed with the result that I have decided to stick with Endura for my future training, racing and recovery nutrition needs. Being an Australian company who prides themselves on quality without compromise the decision to switch has been an easy one. The next Endura test will be Alice where I will use a concentrated Optimiser mix in gel flasks (thanks for the tip Dave) coupled with standard gels and water. Until next time keep any eye out on Team KSR as we are pencilling in our next 12 months of events and will have lots of exciting news to share.